Died: 8th May 1915; age 24; KiA. Residence: 1a, Salem Street, Ipswich. Rank: Private; Service Number: 8056. Relatives Notified & Address: Son of Elizabeth Carpenter, of 1a, Salem Street, Ipswich. Brother to BRYANT EDWARD CARPENTER & HERBERT SIDNEY CARPENTER. 1891 21, Fairlight Street, Ipswich. Willie was 10 months old and living with his parents & siblings. William James Carpenter, 29, a Carman, born Westminster, London. Elizabeth Carpenter (nee Orford), 29, born Great Oakley, Essex. Ethel Emma Carpenter, 8, born Ipswich. Bryant Edward Carpenter, 7, born Ipswich. Florence Gertrude Carpenter, 4, born Ipswich. Annie Maud Carpenter, 3, born Ipswich. 1901 75, St. Margaret’s Street, Ipswich. Willie was 10 years old and living with his parents & siblings. William, 39, a General Labourer. (Nellie) Ellen Elizabeth Carpenter, 9, born Ipswich. Charles Frederick Carpenter, 7, born Ipswich. Herbert Sidney Carpenter, 3, born Ipswich. Albert Stanley Carpenter, 2 months, born Ipswich. 1911 Barrosa Barracks, Stanhope Lines, Aldershot, Farnham, Surrey. Willie was 20 years old, a Soldier ranked Private in the 2nd Battalion of the Suffolk Regiment. Willie’s father, William James Carpenter, died 1906, Ipswich. Soldiers’ Effects to mother – Elizabeth Carpenter, brothers – Frederick, Charles, Herbert, Sidney, and No. 5652, Pte. Bryant Carpenter, c/o 3rd Suffolk, Felixstowe, and sisters – Ethel, Florence, Annie & Elizabeth. William is also remembered on the war memorial at St. Matthews Church, Ipswich. Mrs. Carpenter, of 1a, Salem Street, Ipswich, has four sons and a son-in-law in the Army. 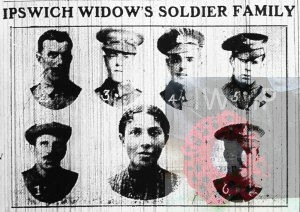 Prior to May last she had five sons serving, but lost one at Ypres on May 8th, 1915. Their names and regiments are as follows:- 1. Prvt. B. Carpenter, 2nd Suffolks, who has been out since the beginning of the war, was wounded on March 3rd last. 2. Prvt. 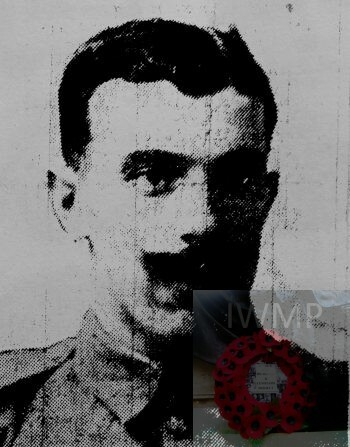 W. Carpenter, 1st Suffolks, killed at Ypres, May 8th, 1915. 3. Gunner C. Carpenter, East Anglian (Howitzer) Brigade, R.F.A., joined in June last, now in training at Mildenhall. 4. Prvt. G. Carpenter, 4th Suffolks, joined in May, now in training at Alton West, near Tring, Herts. 5. Driver S. Carpenter, East Anglian (Howitzer) Brigade, R.F.A., at Mildenhall. 6. Bombr. F. Hood, East Anglian (Howitzer) Brigade, R.F.A.